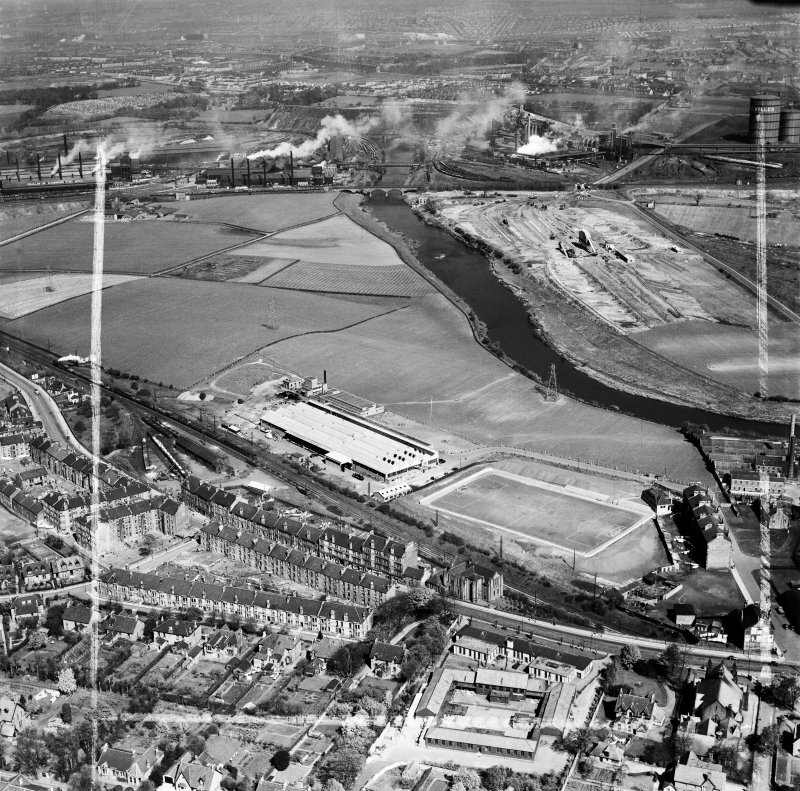 Glasgow, general view, showing Hoover (Electric Motors) Ltd. Cambuslang Works, Somervell Street and Bogeshole Road Bridge. Oblique aerial photograph taken facing north. 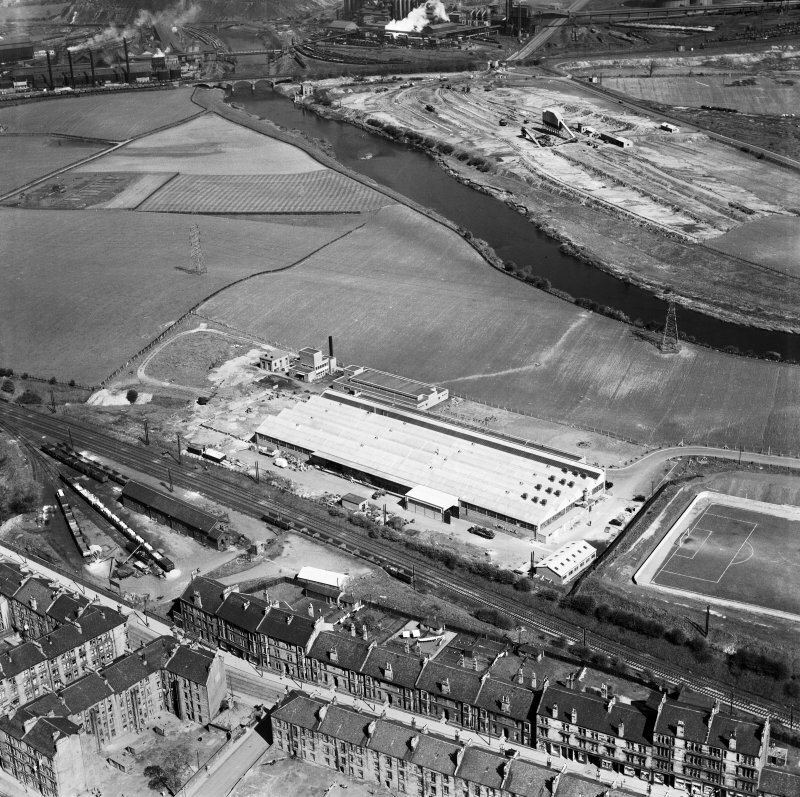 Glasgow, general view, showing Hoover (Electric Motors) Ltd. Cambuslang Works, Somervell Street and Bogeshole Road Bridge. Oblique aerial photograph taken facing north. This image has been produced from a crop marked negative. A view of Bogleshole Road Bridge, taken from the north east. For railway viaduct adjacent to N, see NS66SW 609. Bogeshole Road Bridge. Only a few yards upstream from the viaduct NS66SW 609; [built] 1986. Engineer Strathclyde Regional Council; builder Raynesway Construction Services Ltd. A steel plate girder bridge of moderate span, the girders tapering in depth to show a gently arched soffit line in the main span and matching curves in the two half-spans reaching from thin concrete supporting piers on the banks of the river to the ends of the approach embankments. Concrete deck and simple tubular steel railings. 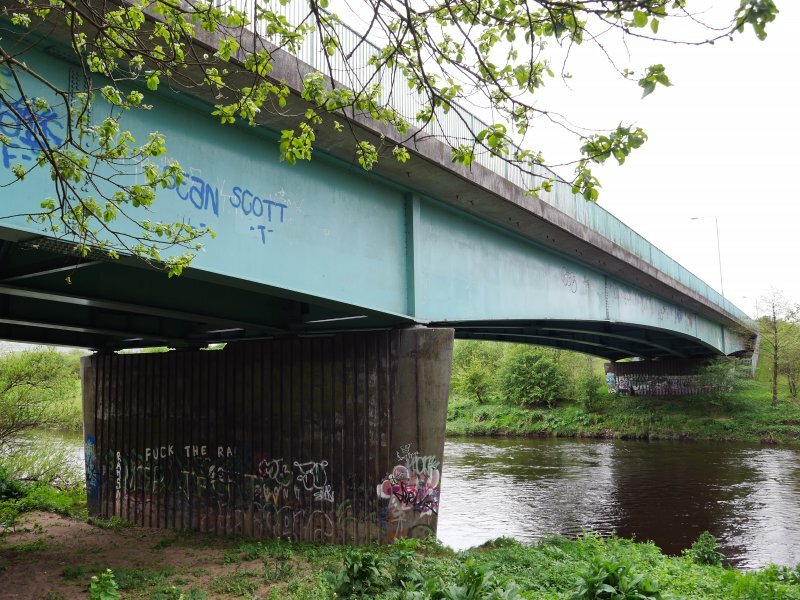 This bridge carries Cambuslang Road over the River Clyde to the W of Cambuslang. The river here forms the boundary between the parishes of Rutherglen (to the W) and Old Monkland (to the E). The location assigned to this record defines the centre of the span. The available map evidence suggests that the structure extends from NS c. 63565 61834 to NS c. 63661 61842.